What’s it like to be employed by one company but work for another? You could ask that of most LAC Group employees, because the majority are engaged in external assignments delivering Library as a Service®. Their paycheck comes from LAC Group, but their work is in law, business, media and entertainment, government and higher education, performed remotely or at the client site. Comparable benefits complying with local regulations and customs offered in all locations. Visit LibGig, our online job board and career network dedicated to positions in information management and the library sciences. 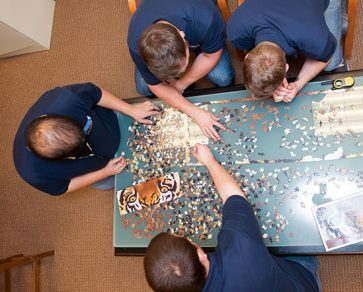 LAC Content & Archives employees collaborate on a puzzle during break. Gain access to a variety of different projects and work environments suited for your skills and preferences. Try different roles and responsibilities to advance your career with new experience and connections. You may be able to work from home, eliminating the daily commute and enabling more flexibility for family and personal obligations. With LAC Group, new opportunities arise regularly for those willing to step forward and share their career needs and goals. Join a team of savvy, experienced professionals who are shaping the future of library and information services. You don’t need us to tell you that librarianship is drastically changing. LAC Group is at the forefront, and we invite talented, forward-looking people to join us in shaping the future of our profession. The growth, reputation and success of LAC Group can be credited to the individual and collective efforts of our people. We work diligently to promote the fulfillment of each employee’s potential through teamwork, inclusion and equal opportunity. LAC Group supports equal access regardless of race, age, gender identity, disability, ethnicity, national origin, religion, sexual orientation and other individual characteristics. We take action to ensure that disabled persons, veterans and members of minority groups are apprised of openings, hired when qualified, and considered for promotion opportunities. Employees working for LAC Federal services.